What is life? Are we just pawns in someone’s game of chess? These are just two of the life mystery questions posed in the epic album, The Suffering Joy, by Norwegian progressive rock band, Magic Pie. This group is one of those rare bands that can technically hang with the brilliance of Spock’s Beard or The Flower Kings, yet they seem to have their own unique sound while displaying some amazing virtuosity by all the players. 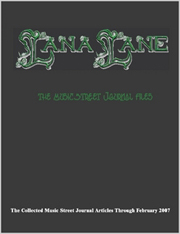 The Band lists its influences, besides the aforementioned, as Deep Purple, Yes, Dream Theater, Pink Floyd, Kansas and Uriah Heep. They have defined themselves accurately. Composed of Kim Stenberg (vocals, guitars), Eirikur Hauksson (lead vocals, guitars), EirikHanssen (vocals, guitars), Lars PetterHolstad (vocals, bass),Gilbert Marshall (lead vocals, keyboards) and J.T. Johannessen (drums), they are simply too good to ignore. Without some listening, it would be easy to dismiss this band with a simple, “I’ve never heard of them,” but that would be a mistake to the progressive rock fan who desires to be immersed into great music played by heavyweights. Magic Pie doesn’t disappoint. Founded in 2001 and signed to Progress Records in 2005, the band previously recorded Motions of Desire and Circus of Life, both of which I found to be extremely fine works. The album leaves one with some deep thoughts that may take the listener to many conclusions. I really appreciate the lyrical depth, musically expressed so well! I recommend this impressive work for all, novice or not when it comes to the fantastic music of Magic Pie! The vocal introduction opens this multi-movement piece in Part 1, “Questions Unanswered.” It segues cleanly into the multi-metered instrumental passage of “Overture” (Part 2). Plenty of soaring arpeggios flow in unison on the fine instrumental work, tightly flowing guitar phraseology, stellar keyboard and bass lines move swiftly and without flaw over some pretty incredible technical drum playing. Part 3, “A Brand New Day,” starts with the springtime birth of a beautiful boy, and this section is imbued with fantastic vocal harmonies! The technical classical prowess of Magic Pie’s vocal chemistry is well above the level of what tends to be heard in contemporary music. The guys know how to sing properly and they phrase with perfection, and that cannot be underscored enough. In the story, the boy grows and is sent to school. That’s where the tempo kicks up to 120 at Part 4, the title track, “The Suffering Joy,” where we hear of the child’s drive for independence and questioning authority, learning from life’s experiences. It really reminds me of the boy’s journey in C. S. Lewis’ Pilgrims Regress, and I cannot ignore the obvious Christian apologetics inherent in the writing, which is very solid stuff, indeed. This is a sixteen minute movement, and it is truly a story musically and lyrically. 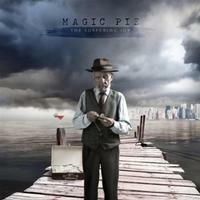 Magic Pie seems to bridge the chasm between darker progressive metal and the brighter sounding neo-progressive bands. This creates a beautiful and dynamic flavor that covers a wide range of emotional states. After all, as they say clearly, the road to Hell is paved with good intentions. As Christians we do suffer; it is part of God’s plan for us to overcome ourselves. This message is clear, and the music reflects the difficulty in finding that balance between suffering and the joy of succeeding in what we attempt, hence the suffering joy. I love the harmonic minor flavor and the unique stylistic treatments through this lengthy movement and the key change back to major. The hooks and grooves are well placed, transition very well, and the solo work throughout is impeccably clean. I dig the “ear on perfection” in this band! As the lyrics state, “Wherever we are, life is not a one-way destination / It’s filled with suffering joy.” How true. This piece is written in three, and is a superb production number. I tuned into the progressive waltz feel. It’s a really nice changeup. The synth call and answer lines with vocals are cool. The crunchy bridges build tension nicely, and the guitar feature sells the dynamic variety in the whole piece. There is a pyramiding ensemble buildup mid-piece, followed by a well –phrased vocal duet. What a beautiful song this is! The vocal ensemble builds to a series of guitar/keyboard descending lines as the counter-rhythm slowly ascends, resolving to a sensitive vocal solo to the end of the song. This is filled with hope and opportunity for doing great things to inspire the spirit. An exquisite vocal, acoustic guitar, piano, strings and finally snare drum each enter to give dynamic range to this mid-tempo ballad interlude. It’s a very pretty, quixotic driven song. The band veers sharply, turning the feeling of the prior song on its ear, revealing shades of Iron Maiden, Spock’s Beard, and even Rush in the sixteenth note driven introduction. Nice transitional phrasing is presented via acoustic guitars and solo vocals. The melody is haunting, tempered with perfectly placed background harmonies. Great instrumental tension arrives in the bridge, and the second verse has nice contrast vocals to rhythm. The solo bridge bears shades of Ajalon, and the male/female vocal feature is positively wonderful over the rich multi-rhythmic backdrop. This production features a triumphantly positive progression over a repeating syncopated bass/drum rhythm. Vocal lines are long and stretch “soaring higher and higher,” to steal from the lyrics. The song moves into another outstanding guitar feature, and then segues to a mysterious ambient vocal segment. Gilmouresque guitar parts accentuate the vocals. The message reveals the fatigue at hitting frustrations and roadblocks in reaching out to find our happiness and reach our goals. “I’m tired of the sickness that drives our world insane.” This is fantastically written stuff! The band, once again, accurately reflects a wide emotional range. The ensemble clarity and tightness on unison lines that begin with one voice are very well executed. I love the instrumental groove in the latter third of the piece. The guitar lines are fast and clean. What a cool song this is! The album concludes with this composition, opening darkly and insidiously, evoking the unknown. The tension builds. The burdens of time and age have left the, now old man, with the question of whether his efforts have been worthwhile. Has he accomplished anything better than a broken dream? Is it all worth it? The song grooves in three, and harmonically draws comparisons to The Beatles’ “I Want You (She’s So Heavy).” The man wants to be free from it all. The oppressive feeling is quite evident. The pattern fades, a baby cries, and the questions from the beginning of the album are now re-stated in spoken form, as the cut ends.